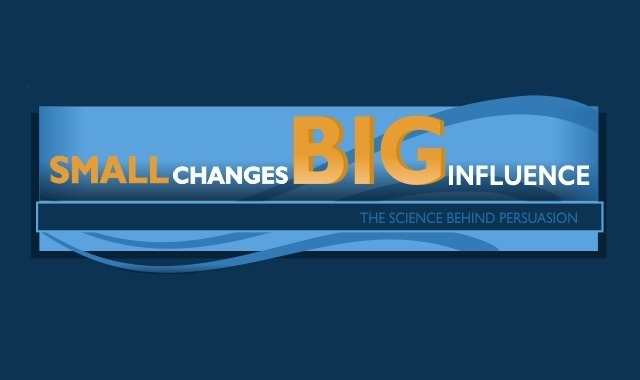 Small changes Big Influence #infographic ~ Visualistan '+g+"
Ask someone, “Would you like to be more influential and persuasive?” The answer will either be a resounding “yes”, or an apprehensive “yes”. “Why apprehensive?” you ask? Quite simply, it’s because people may have ethical qualms about influencing and persuading others to do something. Yet, this is perhaps a slightly misguided view of the science behind influence and persuasion. For many, their jobs rely heavily upon being able to convince others to follow a specific action, whether directly or indirectly. After all, it’s not just salespeople and marketing executives who need to know how to persuade others. Doctors need to be able convince patients to follow their instructions and keep to appointments; politicians need to be able to win over the electorate (or just vote in the first instance! ); and writers need to know how to get others to take an interest in their writing! Read on to see how even the smallest changes can make you a more influential and persuasive person, without having to make any drastic changes to your behaviour, and without needing to be morally questionable!